A-Team Performance 21 STANDARD CIRCUIT UNIVERSAL WIRING HARNESS MUSCLE CAR HOT ROD STREET ROD NEW XL WIRE A-Team Performance parts are sold exclusively by Southwest Performance Parts. A-Team Performance 21 STANDARD CIRCUIT UNIVERSAL WIRING HARNESS MUSCLE CAR HOT ROD STREET ROD NEW XL WIRE 21 Circuit Street Hot Rat Rod Custom Universal Color Wiring Wire Kit XL WIRES Brand new A-TEAM PERFORMANCE 21 circuit wire kit. This is a complete Bumper to Bumper wire kit, it will have more than enough wire for your project. Wires are marked every 12" to help with instillation. 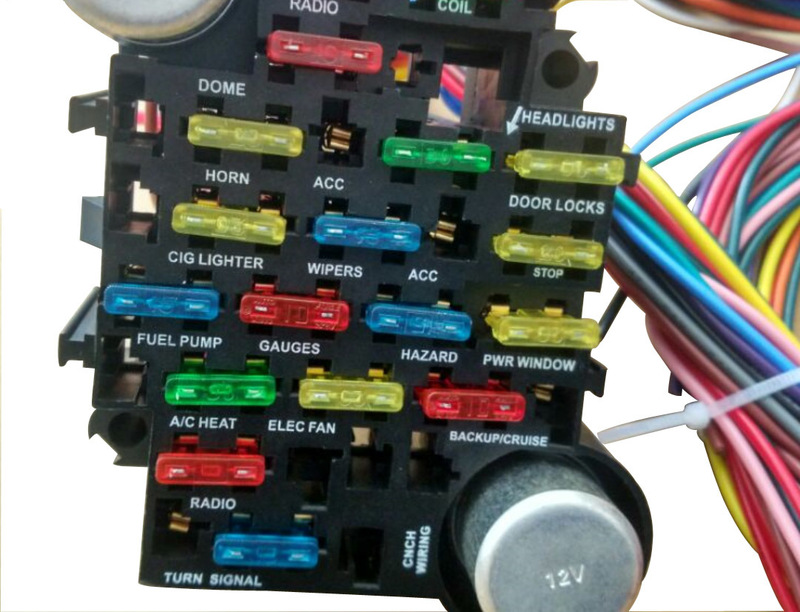 This kit has circuits for Radio, Coil, Dome Light, ACC 1, Headlights, Door Locks, Cigarette Lighter, Wipers, ACC 2, Stop Lights, Fuel Pump, Gauges, Hazard, Power Windows, A/C Heater, Electric Fan, Backup/Cruise, Radio and Turn signal. This Wiring Kit Contains the Following: 1 Pre-Wired Fuse Panel w/ 17 Fuses and 1 Breaker. 2 Signal Flashers and 1 Pre-Wired Relay Connector w/ Horn Relay. 2 Pre-Wired Headlight Plugs. 1 Pre-Wired Late GM Alternator Plug. 2 GM Turn signal connectors for the Pre-Terminated Wires. 1 Fusible Link. 1 Large grommet 30+ Insulated Terminals and Small Cable Ties. 2 Loose Wires (Neutral Safety Switch Wire and Panel Light Wire). This wiring kit features a thick coating over the copper wire. The gauge of the wiring ranges from 10 gauge to 18 gauge depending on what the wire is for. The wires are GM color coded and, labeled. 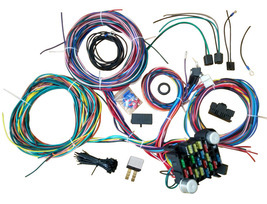 This complete wiring harness is perfect for almost any car or truck project. It includes detailed installation instructions. It is Great for most Street Rods, Classic Cars and, Hot Rods. A-Team Performance parts are sold exclusively by Southwest Performance Parts.